With the LogicNets platform you can visually model any type of logic or decision process to easily build and continuously enhance smart applications. All without programming. 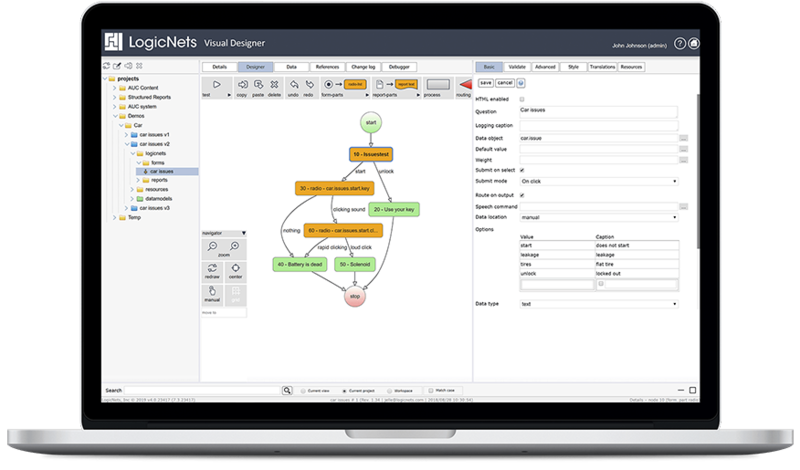 Using the LogicNets designer, you can visualize your expert problem-solving or decision processes as a series of interconnected steps that trace your logic. No matter how complex, our visualization environment makes it easy to render your process and manage it over time. Every new application starts as a project in the designer. A project uses designated folders to organize all the items that make up your project. These include the “logicnets” or visual flows, media files, existing data resources, and layout templates. 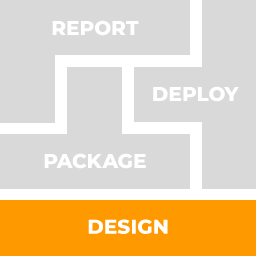 Visually model process flow nodes using drag and drop to create and structure the building blocks of your applications. Use “form nodes” to create dynamic forms for users to interact with. “Process nodes” give you an extensive repertoire of data and system processing functions to perform background tasks such as calculations. Depending on the outcomes of the actions in these nodes, you can progress to other steps and you can use “rules” to drive this navigation. When users interact with your application, the system runs your models to define the behavior of the application. The LogicNets designer provides an extensive range of node types that you can configure to build your models. Form nodes include elements such as text inputs, radio lists, report nodes and data tables. Process nodes are nodes that the end user does not see for actions such as calculations, data manipulations, calling external systems, or sending emails. Conditional nodes are used to direct the flow of the application and include rules and routers. Properties of the nodes are set in their corresponding editors. Whether you ask a user a question with a form node or you perform a calculation in a process node, you specify where the associated data is stored in your application’s data model. These data objects are available to be used at any time in any of the actions in your process nodes or for affecting the routing or outcomes of subsequent nodes. You can view and organize your data model directly. You can save it persistently and share between sessions or other LogicNets applications. You can also import an existing data model if you already have one. A unique aspect of the LogicNets platform is that you can link any article of information (PDF’s, images, video, etc.) to any specific node in your models. These can range from user manuals in technical support applications to literature containing evidence for medical decisions. As users progress through an application, they can access these resources as contextual help, leveraging the value of your pre-existing and external knowledge content. Connect to external applications and data sources through our web services integration building blocks or via ODBC. As you model, run your applications directly from your designer content to see exactly what your users will experience. Find and manage in bulk any content element used in any of the components of your designer and the projects you’ve created. Integrate LogicNets extensive access control and security features with your enterprise infrastructure to manage access to the designer and your LogicNets applications using Active Directory, OAuth, or SAML. Optimize graphical pathway views for your users. The Designer provides a full range of intuitive manual layout controls so that your graphically rendered end-user pathways have the exact appearance you require. Integrate seamlessly into the Healthcare workflow. LogicNets approach for structuring knowledge is a natural fit for Healthcare applications – particularly clinical decision support and structured reporting. LogicNets provides powerful integration modules which support FHIR, Quick, HL7 and CDS-Hooks and enable healthcare connectivity and advanced informatics. Predict and guide to optimal outcomes. LogicNets can track how users interact with your applications. That data can be used to predict most likely pathways to users. This can be used in troubleshooting applications to predict the most likely cause or in healthcare applications which diagnosis is most likely. Share and collaborate your application designs with your peers. LogicNets provides a comprehensive content management repository that allows you to check content in and out of a central controlled environment. You can leverage the work of your colleagues and you have complete visibility into changes and version history.